A few weeks back, I tracked down a resource that possibly had fresh information on Clara Bäuerle. If you recall, Clara is considered by some researchers to be a potential candidate for the mysterious Bella in the Wych Elm. Several online resources, however, indicate that Clara died in Berlin on 16 December, 1942. I've been trying to dig up information to substantiate that date. 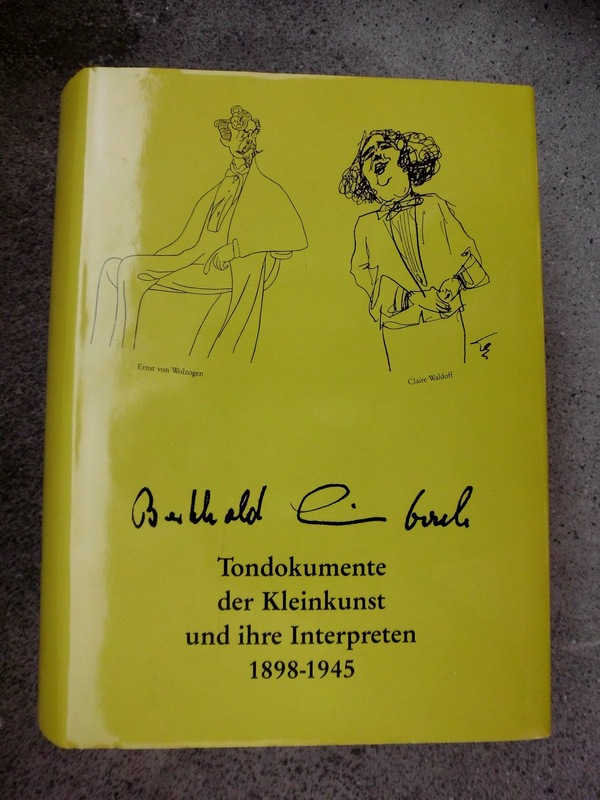 This new resource: Tondokumente der Kleinkunst und ihre Interpreten: 1898-1945 (privately published by Berthold Leimbach in 1991) had a page on Clara Bäuerle, a portion of which was visible on Google Books. This rather obscure book isn't available in North America, so I had a cousin track it down in the Staats Bibliothek zu Berlin (Berlin State Library). After much anticipation, my cousin sent me a scanned image of the relevant page. Top left - brief biography of Clara. Top right - the standard promotional photograph that Clara handed out at concerts. This is the same image that Josef Jakobs had in his possession. Bottom part of the page is a discography of Clara Bauerle's recordings, which I had already tracked down through other means. Soooo... what does the biography actually say? Good question. Als Hedwig Clara Bauerle am 27. August 1905 in Ulm geboren. Die frühen Jahre liegen im Dunklen, erst 1936 taucht sie als Schauspielerin am Stadttheater Gera auf. Es folgen Engagements in Landsberg (1937) und Pforzheim (1938). 1939 und 1941 wird ihr Name in den Bühnenjahrbüchern noch einmal erwähnt, dann nicht mehr. Bekannt geworeden ist Claire Bäuerle wohl auch eher als Sängerin (Altistin) des berühmten Orchesters von Bernhard Etté. Auch der Film holte sie sich. Born as Hedwig Clara Bauerle on 27 August 1905 in Ulm. The early years lie in darkness; she first surfaced in 1936 as an actress at the Gera City Theatre. There followed engagements in Landsberg (1937) and Pforzheim (1938). In 1939 and 1941 her name appeared one last time in the Theatre Yearbooks but nothing after that. Claire Bäuerle became most well known as a singer (contralto) with the famous Bernhard Ette Orchestra. She also appeared in movies. Alas, no mention of her death but... it would appear that her full name was Hedwig Clara Bäuerle, a very interesting clue. While MI5 was investigating Josef Jakobs' association with Clara Bäuerle, they tried to determine if she had ever been to the United Kingdom. They found a German named Klara Sofie Bäuerle, born on June 29, 1906; arrived in the United Kingdom in October, 1930; left Warwickshire for Germany at some unknown date. The Central Register of Aliens had been notified of her departure on June 21, 1932. From this, it would appear that Hedwig Clara Bäuerle and Klara Sofie Bäuerle were two very separate individuals. There is no evidence that Clara Bauerle traveled to the United Kingdom during the 1930s. As for the author of the Tondokumente book - he appears to have passed away in the 2000s.